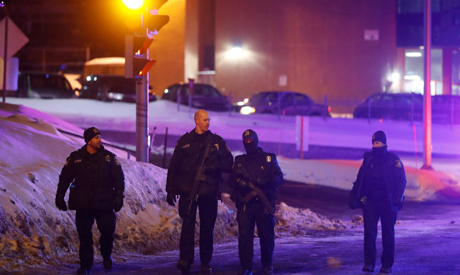 Six people died and eight were injured after gunmen opened fire at a Quebec City mosque, a shooting that Canadian Prime Minister Justin Trudeau condemned Monday as a "terrorist attack." Police spokeswoman Christine Coulombe told journalists that two suspects were arrested following the attack, that police were also treating as an act of terrorism. Trudeau said in a statement that "we condemn this terrorist attack on Muslims in a center of worship and refuge." "Muslim-Canadians are an important part of our national fabric, and these senseless acts have no place in our communities, city and country." According to witnesses interviewed on local television, two masked gunmen entered the cultural center around 7:15 pm (0015 GMT) on Sunday. The motive of the attack was not immediately clear. Police quickly set up in the mosque's vicinity. Coulombe said those killed were between ages 35 and 70. Police did not rule out the possibility of a third suspect who had fled the scene. "It is heart-wrenching to see such senseless violence," Trudeau said. "Diversity is our strength, and religious tolerance is a value that we, as Canadians, hold dear." Quebec Premier Philippe Couillard said in a series of Twitter posts that the government was "mobilized to ensure the security of the people of Quebec." "Quebec categorically rejects this barbaric violence," he wrote. "Solidarity with Quebec people of Muslim faith." Police stationed near the mosque told AFP that they had been preparing for this type of attack "because it's happening all over the world." "I don't understand why here -- it's a small mosque," said a man who was inside the center at the time of the attack. "It's not Montreal or Toronto." The mosque has already been the target of hate: a pig's head was left on the doorstep last June during the Muslim holy month of Ramadan. Other mosques in Canada have been targeted with racist graffiti in recent months. The attack comes as Canada has vowed to open its arms wide to Muslims and refugees after US President Donald Trump's controversial immigration ban Friday sparked travel chaos and outrage around the world. Canada will offer temporary residence permits to people stranded in the country as a result of Trump's order, the immigration ministry said Sunday. "Let me assure those who may be stranded in Canada that I will use my authority as minister to provide them with temporary residency if needed as we have done in the past," Immigration Minister Ahmed Hussen said at a news conference. Trump has suspended the arrival of all refugees to the US for at least 120 days and barred entry for 90 days to people from seven Muslim-majority countries: Iran, Iraq, Libya, Somalia, Sudan, Syria and Yemen. Hussen, who is of Somali origin, did not condemn the US measure but stressed that Canada would continue to pursue an immigration policy based on "compassion" while at the same time protecting the security of its citizens. "We welcome those fleeing persecution, terror and war," he said, echoing a welcoming Twitter post by Trudeau on Saturday. According to the latest Canadian census, from 2011, one out of five people in the country are foreign-born. Canada has welcomed more than 39,670 Syrian refugees between November 2015 and early January 2017, according to government figures.